Geologists work with time but their clock started ticking 4.5 billion years ago! Imagine therefore how much a geologist would value the invention of a time machine. A machine that would allow him or her to move through time and study at first hand an ever changing planet. Our perception of the world at any time during its long history is based on the sophisticated study of rocks and minerals undertaken by geologists. They can interpret the environments and geography of our planet from the rocks they study and provide an insight into the complex relationships that developed between the evolving planet and the animals and plants that existed on its surface. Geologists are trained to observe, measure and record and they keep detailed field notebooks with notes and annotated drawings. Any geologist travelling through time would adopt a disciplined approach in order to write up his or her finds and experiences at a later date. The same discipline was adopted by the natural scientists of the 17th to 19th centuries, long before radio and television. A Time Travellers Field Notes and Observations of Dinosaurs relates the tale of a bright young naturalist who discovers a time machine in her father’ workshop (the family summerhouse and garden shed). She learns how to use the machine and is soon visiting ancient time zones. The story is set in the year 1915 and her voyages through time involve the use of a book written by her father who was away in France serving King and Country. The book indicates that her father had travelled both back and forward in time hence her detailed knowledge of a host of scientific facts such as the geological timescale and of animals and plants described for each of her voyages. From the beginning of her adventures she adopts a mature scientific approach and her journal records in detail her experiences, observations and sketches. 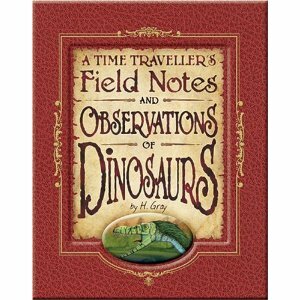 The journal is beautifully reproduced as A Time Travellers Field Notes and Observations of Dinosaurs. It is essentially a field notebook with interesting asides about her family and friends and her dog named Bruno. The book is faithfully written in the style of a mature and educated young lady of the early 1900’s. It provides an enjoyable and informed insight in an ancient world populated by the most fascinating creatures to have lived on Earth. It stretches beyond the normal everyday description of a host dinosaurs by size, weight and types of teeth. It involves the reader in the joy of escapism yet clearly illustrates the need to record and observe diligently and to write and express oneself clearly if your want to be part of history yourself. A Time Travellers Field Notes and Observations of Dinosaurs is written by Henrietta Gray and beautifully illustrated (in real life by Robert Nichols and Neil Reid). The book is different in approach and is charming and innovative in terms of the storyline.